Uglyworld #1425 - Mystical Cookies (Project TW - Image 26-366), a photo by www.bazpics.com on Flickr. One minuter I was sittings in the hotels room watcherings TV, then the next minuter I hears a noise behinds the curtains over ats the window. Obviouslies I hads to go checkers out what had makereds the noise, so I tippy-toe'd over to the curtains and slowly pullereds them back from the window. 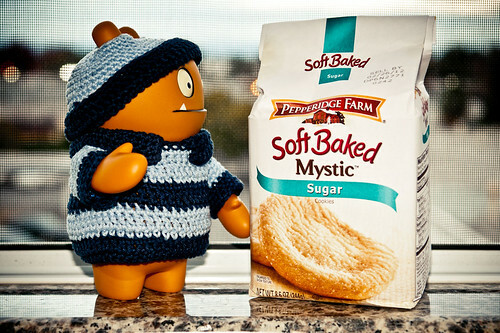 Wowzers, hows the hell can a packeter of cookies justs appear on the windows ledge...??? The name says it alls, mystical cookies, yes indeedy...!! !